In the spring, summer, and fall at our house, we’re pretty active cyclists—for recreation, exercise, and transportation. As any cyclist knows, storing bikes can be an issue. Rather than allow our bikes to occupy valuable floor space, I installed ceiling hooks on which we can hang our trusty two-wheelers. The hooks proved to be a good solution to our storage problem, but installing the hooks posed a problem of its own. When drilling holes through wallboard and joists, how would I avoid getting totally covered in plaster dust and wood shavings? 1. Paper Plate Catch-All. 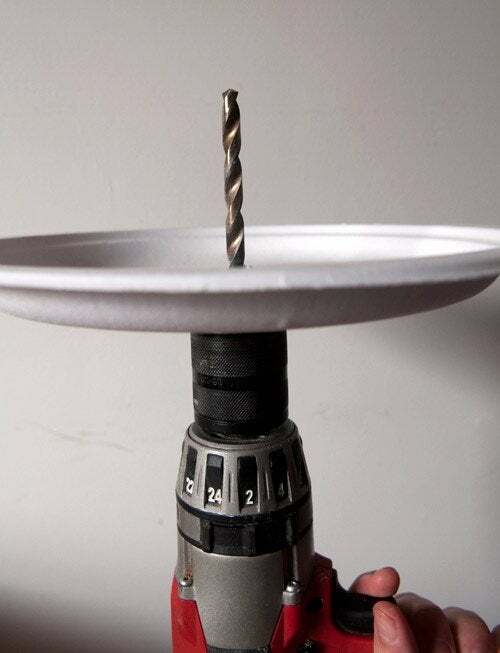 Simply select your drill bit—whichever size you need for your pilot hole—and drill a hole through a sturdy paper plate. 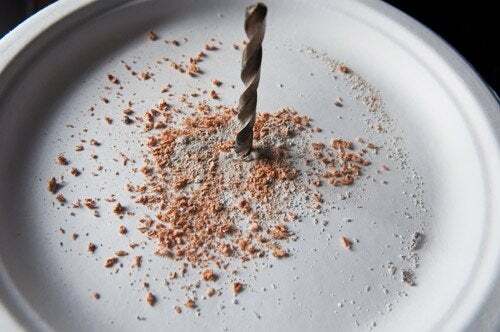 Then insert the drill bit through the bottom of the plate, and drill away. This is how much debris was captured by drilling a 5/16″ hole. Under all that sawdust (from the ceiling joists), there is a good two tablespoons of ceiling dust that would have ended up on me and my carpet and furniture. The paper plate? Definitely worth the ten seconds it took to attach. So that got me thinking: What other cool tricks and ideas are there for dealing with messy DIY efforts in finished spaces? 2. 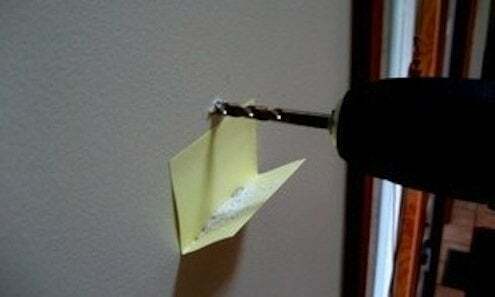 Post-It Note. I learned this trick a few years ago, and it’s saved me all kinds of clean-up after drilling pilot holes for screws or wall anchors. Simply take a sticky note and fold it in half. The crease forms a nifty little shelf that catches most of the wallboard dust you’re likely to create. Any dust that isn’t caught can be easily wipe up with a damp rag. 3. Plastic DVD Case. 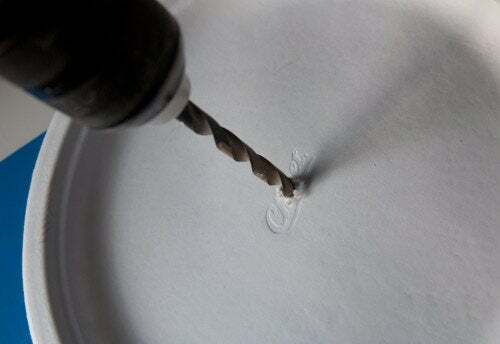 Davey at Lifehacker came up with an ingenious method of containing the dust and shavings that larger drill bits tend to produce—covering the drill bit with an empty container of blank CD/DVDs. Simply hold down the plastic cover as you’re drilling, and the inevitable mess is neatly contained. Don’t have a CD/DVD spindle lying around? You could just as easily use a plastic cup or spray-can lid. 4. Hand Vacuum. Sure, holding the hose of your shop vac next to your drill bit would work, but carting out the vacuum seems like a lot of effort if you’re only drilling one or two holes. Consider using a cordless hand vac instead. If the project requires you to use both hands on the drill, perhaps you can convince a friend to operate the vacuum as you work. 5. Junk mail. Shelley at There Is Hope! demonstrates how to make a “drill pouch” out of an old envelope. 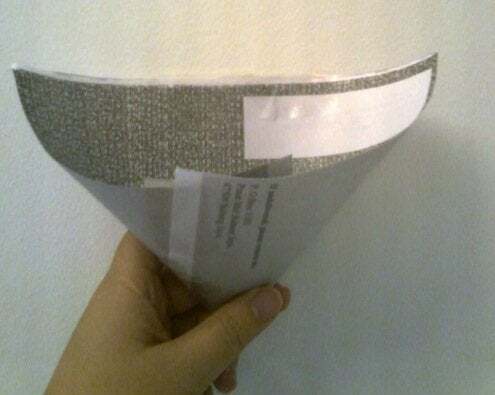 (A sheet of paper or scrap of newspaper would work equally well.) Just make two quick folds, then apply a bit of painter’s tape to hold the shape.